Another name for Simon was FYNN. Simons bap notice at Barking (and Offton) SFK spells his name Fynn. "Simon Fynn of Simon & Mary was baptised Jan 16", page headed 1741. On the next line below is an entry " William Fynn of James & Susanna was baptised March 1st" but Coddenham Registers show "Fenn Simon son of Simon and Mary his wife (late Fulcher) buried 17 Nov 1806 aged 65 years" John Longe Vicar. Singleman and husbandman, and singlewoman of Coddenham. To be married at Coddenham. Bacon who died about this time passed the Coddenham living and surrounding lands to his relative John Longe. Valley Farm had a farm house and substantial farm buildings which exist to this day (1999). The rental valuation for the 219 acres was L175 17s 0d. The valuation document records that it was let to Simon Fenn at L175 from Michaelmas (Oct 11) 1791 for 15 years. The land consisted of 27 acres of pasture and 192 acres of arable land. Simon farmed additional fields belonging to Longe in the surrounding locality. Later Simon is recorded as paying tithes to the Coddenham Church until 1806, based on a valuation of the farm of L160. This valuation was second only in the roll, to the value of Sir William Middleton's property at L170. Land Tax Redemption 1798. Coddenham Suffolk. Rev Jn Longe proprietor, Simon Fenn occupier, tax £16 0s 0d. April 16, 1800. Paid S. Fenn for 5cb of barley @ 13' - L3 5 0. Simon was also Principle Inhabitant in 1791, a surveyor for the parish in 1792, churchwarden 1798. His last signature to the record is as a Vestryman in 1805. 1803 ref HB16 29/40 Simon Fenn (occupier) Longe (proprietor) tax 16/- per annum. Simon Fenn (proprietor) William Barker (occupier) 12/- p.a. Ipswich Journal "Simon Fenn of Coddenham died 1740 - 1806". " Tues se'nnight died in his 66th year, much respected by all who new him, Mr Simon Fenn of Coddenham farmer"
Coddenham Churchyard monumental inscription transcript reads: "To the Memory of Simon Fenn who died November 11th 1806 aged 65 years"
THE WILL of SIMON FENN of CODDENHAM. In the Name of God Amen: I Simon Fenn of Coddenham in the County of Suffolk, farmer being of sound and disposing mind memory and understanding hereby revoking all former and other Wills by me at any time heretofore made do make publish and declare this my last Will and Testament in manner and form following (that is to say). First I give and bequeath unto Elizabeth my beloved wife my best bedstead with the furniture bed bedding blankets pillows and linen thereunto belonging and commonly used herewith and also a sufficient quantity of household furniture proper and necessary to furnish two rooms to be allotted and set out at the discretion of my Executors herein after named to and for her own separate use and disposal. Also I give and bequeath unto the said Elizabeth my wife one annuity or yearly sum of fifty pounds free and clear of and from all or any parliamentary parochial or other payments or deductions whatsoever for and during the term of her natural life to be paid to her as the same shall from time to time be received by four even and equal quarterly payments in every year the first payment to begin and be made at the expiration of three calendar months next after my decease and for the purpose before mentioned I do hereby authorise empower and direct my Executors herein after named their Executors or Administrators to place out at interest in their names but not at their hazard upon Real or Government securities such part and a sufficient part and so much of my personal estate that the interest money arising therefrom shall and may be sufficient to pay and discharge the said annuity or yearly sum of fifty pounds at the times and free and clear of all deductions as aforesaid. Also I give and bequeath all the rest and residue of my household furniture plate linen china stock of liquor and also my farming stock both live and dead crops of corn hay stover grain and seeds as well growing as stored And also the immediate use and occupation of the farm lands and premises now used and occupied by me together with all my estate and interest in the unexpired term of the lease hereof unto my son Robert Fenn his Executors and Administrators he and they paying and discharging all arrears of rent rates and taxes which shall be due at the time of my decease. Also I give and bequeath the sum of ten pounds to the industrious poor of the Parish of Coddenham aforesaid to be distributed at the discretion of my Executors within the calendar month next after my decease. I give and devise unto the said Robert Fenn my brother Robert Fenn my son George Goodwin and Theodore Banyard Coates their Exec's & Assign's In trust that they the said Robert Fenn my brother Robert Fenn my son George Goodwin and Theodore Banyard Coates and the survivors of them and their Exec's & Assign's of such survivors do and shall as soon as conveniently may be after my decease absolutely sell and dispose thereof either together or in parcels and for the best price or prices that may or can be reasonably obtained for the same And my will is that the receipt or receipts of the said Robert Fenn my brother Robert Fenn my son George Goodwin and Theodore Banyard Coates or the survivors of them or of the Heirs Exec's Administrators or Assigns of such survivor shall be a sufficient discharge or discharges to such purchaser or purchasers for his her or their purchases of or for all or any part of my said Estates whether freehold or copyhold or for Customary Holden or for so much hereof for which such receipt or receipts shall not be answerable for the misapplication or nonapplication of the said purchaser monies or any part thereof and the monies arising by such sale or sales and by and out of the funds issues and profits of the said Estates and premises until such sale or sales thereof together with such principle money after the death of my wife as is before directed to be placed out at interest and also all the rest residue and remainder of my monies securities for money personal estate and effects whatsoever and wheresoever after payment of my just debts funeral and probate charges I give bequeath and dispose of as follows. William Goodwin, Edmund ? Brown, John Marriott. This Will was proved at London the fourth day of March in the year of our Lord one thousand eight hundred and seven before the Right Honourable Sir William Wynne Knight Doctor of Laws Master Keeper or Commissory of the Prerogative Court of Canterbury lawfully constituted by the oaths of Robert Fenn the son of the deceased George Goodwin and Theodore Banyard Coates three of the Executors named in the said Will to whom Administration was granted of all and singular the goods chattels and credits of the said deceased having been first sworn by commission to administer power reserved of making the like grant to Robert Fenn the brother of the said deceased and the other Executor named in the said Will when he shall apply for the same. Copy on file 2002 and under documents in this file 2013. I herewith send you the leases for late Simon Fenn's farm, which I should wish to be altered as I lately mentioned to you, as to his son Robert Fenn, to take place from last Michaelmas; except the mere alteration of the name and the clause "for the life of S Fenn" everything else may remain." However the Coddenham Parish Register dated 2 Oct 1785 show Robert as the son of Simon and Mary. The writers hand at this time is different from the hand of the entries in the first half year of 1785 and 1786. Accordingly the view is taken by the researcher that the writer in October may have been unfamiliar with the Parish families and entered Mary in error. Colin Fenn (2003) confirms that there is no record of any Fenn's buried in Coddenham between 1705 - 1790. Ref LDS film 993236 - 2 Coddenham Church and Churchyard inscriptions to 1884 by Rev Haslewood. "CODDENHAM, a village, a parish, and a sub-district, in Bosmere district, Suffolk. The village stands 3 miles NNE of Claydon r. station, and 31/2 ESE of Needham-Market; and has a post office under Needham-Market. The parish comprises 2, 719 acres. Real property, L.5,300. Pop., 903. Houses, 203. The property is subdivided. Shrubland Park belonged formerly to the Bacons; and is now the seat of Sir W. F. F. Middleton, Bart. 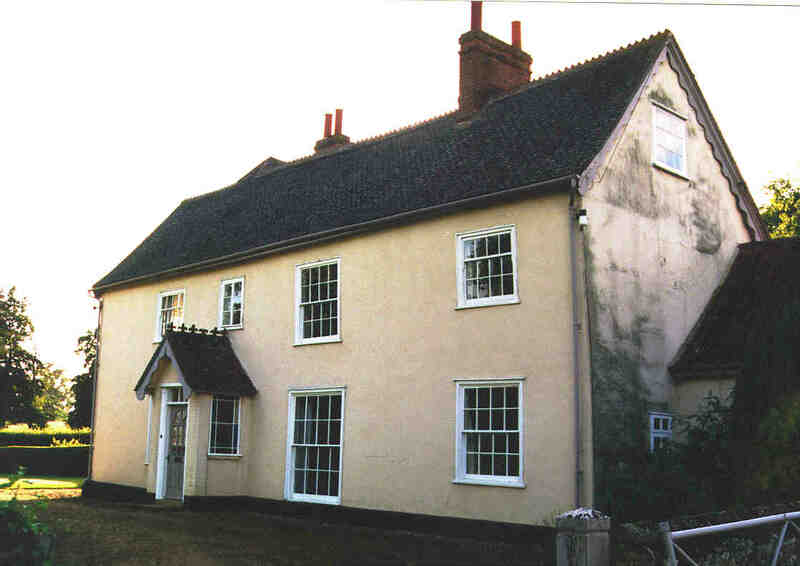 The living is a vicarage, united with the p. curacy of Crowfield, in the diocese of Norwich. Value, L.1,006. * Patron, the Rev. R. Longe. The church is a fine Gothic edifice, with a tower; and has some good monuments. There are an Independent chapel, and charities L.80. -The sub-district contains seventeen parishes and a parochial chapelry. Acres, 30, 765. Pop., 8, 480. Houses, 1, 862. " Coddenham: The church here was given to Royston priory by Eustachius de Merc, the founder, about the year 1220. Here is the manor of Dennies, and here stood the manor-house of Shrubland Hall, where Edward, third son of the Lord Keeper Bacon, became seated, by his marriage with the heiress of Little. Nicholas Bacon, one of his descendants, erected a new mansion in a very pleasant park, which contains the finest Spanish chesnut trees in the county. This edifice having been pulled down, a new one was built in its stead, and became the residence of Sir William Middleton, the present possessor, who was created a baronet in 18O4. It commands an extensive prospect along the Norwich road. Here is also a manor called the Vicarage, being always vested in the vicar for the time being. 1. "Grandfather" Fenn of Coddenham: Notes by Edward Fenn FRCP, 1870. "Grandfather" Fenn of Coddenham had one son Robert, Capt in Yeomanry, who succeeded him in house and farm (Rectory farm belonged to Longe) and married Miss Harriet Liveing, and four daughters two married men in Brad Street one of whom was steward and managing agent of the grandfather of the present Sir N Brooke Middleton of Shrubland Hall by Ipswich and Coddenham one married Mr Goodwin of Stowmarket a jack of all trades - sharp - like old Thorogood, children disliked him. Another married Mr Sherman farmer & miller.